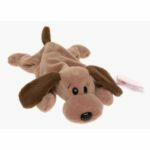 Bones was a favorite among early Beanie Babies collectors, but so many have been produced that only a handful are worth money. The only Bones the Dog beanie babies that are valuable will a 1st generation hang & tush tag. Here is what a 1st Generation Tush Tag looks like. Here are pictures of Hang Tags Generations 1-4. In August 2013 an authenticated 3rd Generation Hang/2nd Generation Tush Bones the Dog sold for $26.00 on eBay. It costs around $20 to authenticate a Beanie Baby so you can see there isn’t a whole lot of value outside the 1st generation ones. 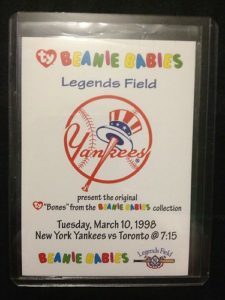 On March 10, 1998 the New York Yankees did a giveaway of approximately 3,000 Bones the Dog Beanie Babies during a game against the Toronto Blue Jays. At current market value, these are only worth around $5-10. 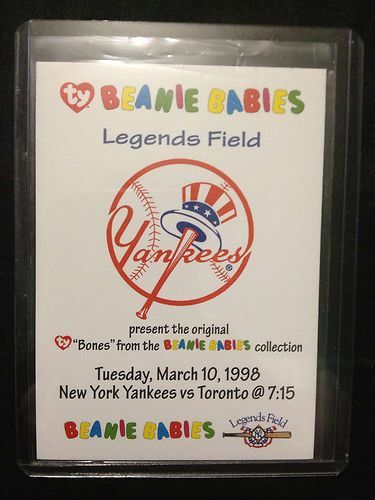 There was a special commemorative card (pictured) that came with the Bones the Dog Beanie Baby. On October 24, 1998 Bones made another appearance for a sports team giveaway. The Chicago Blackhawks gave away approximately 5,000 toys to fans during a game against the Nashville Predators.